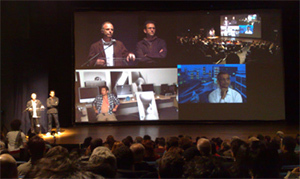 The Center for Research in Computing and the Arts (CRCA) at the University of California, San Diego and partners including the California Institute for Telecommunications and Information Technology (Calit2) staged the first feature film premiere to be streamed on three continents simultaneously in 4K – the super-high-bandwidth format that offers four times the resolution of high-definition TV. 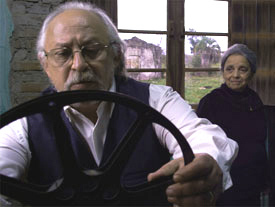 The film by Brazilian director Beto Souza, "Enquanto a noite não chega" (While the Night Doesn't Come), made its debut to a packed theater at the Electronic Language International Festival (FILE 10) world festival in Brazil on July 30. The film (actually, 4K is a video format) was exhibited in Sao Paulo and streamed in real time over high-speed optical networks to the Calit2 Auditorium in UCSD’s Atkinson Hall, and to Keio University's Design Media lab in Yokohama, Japan. The somber yet beautiful film – shot with a Red 4K camera – was produced at a resolution of 8 million pixels per frame, and it was streamed to San Diego and Japan with only a few glitches that were quickly fixed. "Hollywood has dreamed of this for decades," reported CRCA Director Sheldon Brown, who is also Calit2's Artist in Residence and led a large contingent from UC San Diego to FILE 10. "Now an extensive collaboration of artists, technologists and scientists from around the globe – spearheaded by CRCA – has made history." According to Brown, the "global networks being joined together were upgraded to 10 Gigabits per second to support the high bandwidth required for this historic transmission." Brown attributed much of the credit for the success of the event to its Technical Director, CRCA’s Todd Margolis, who coordinated all aspects of the streaming, network setup and teleconference setup. On July 31, the same high-speed network was used to stage a trilateral videoconference using HD feeds among high-ranking government and cultural representatives in Sao Paulo, Yokohama and San Diego, including Calit2’s UCSD Division Director, Ramesh Rao. The HD streams from Keio and Calit2 (pictured bottom left and right windows, respectively on the 4K screen) were in uncompressed HD at approximately 1.5 Gigabits per second. 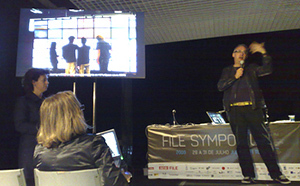 FILE 10 has become an important venue for new-media artists affiliated with CRCA and Calit2. At this year’s event, Sheldon Brown is showing his Scalable City, while Todd Margolis, Ruth West and colleagues are showing ‘ATLAS in Silico,” which had its premiere two years ago at SIGGRAPH in San Diego. 'Between Bodies' by CRCA’s Nina Waisman is on display in Sao Paulo’s SESI Gallery, and Tristan Shone performed 'Dub Machines' in the SESI Theater on July 30 following the 4K film premiere. Calit2’s Mike Toillion also introduced his 4K video, BeatBox 360, remotely from San Diego. 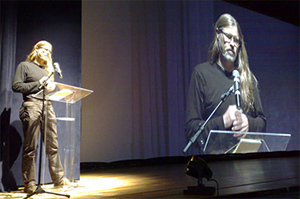 In addition to Brown and Margolis, Miller Puckette, Brett Staulbaum, Calit2 Software Studies Initiative Director Lev Manovich and Calit2's Sonic Arts R&D Director, Peter Otto, were all scheduled to participate in various panels, presentations and workshops throughout the first week of the month-long festival, which runs from July 28 to August 30. Also in Sao Paulo working behind the scenes: Calit2's Hector Bracho, who worked with Margolis in Sao Paulo and the Calit2 audio-visual team back in San Diego to ensure that the streams from Brazil to Calit2 and Keio happened with as few glitches as possible. "We've averaged two-and-a-half hours of sleep each night for the past ten days," reports Bracho, "and my whole team at Calit2 has been working continuously to assist us remotely." Calit2 loaned its two Zaxel Systems 4K streaming servers and other A/V equipment for the effort, and Bracho oversaw 4K local playback in Brazil, including content encoding and tech setup (notably installation of the Zaxel servers, and 4K projector calibration at the Brazilian venue). On the San Diego end, the film was displayed in the Calit2 Auditorium, while Calit2's Rao participated in the July 31 videoconference from Calit2's HD Studio – along with representatives from Keio University in Japan and the hosts in Brazil. Calit2 shared the cost of Bracho's travel with its CineGrid partner, Pacific Interface, and Brazil’s Mackenzie Presbyterian University (a major sponsor of FILE). Calit2's Events committee also supported the effort with cost-sharing to allow use of the 4K playback and Calit2 Auditorium for the film premiere. The network connectivity to support the first 4K film premiere between South America, North America and Asia was a patchwork of super-high-bandwidth (typically 10Gbps) links. The bulk of the U.S. connectivity was supplied by Cisco Systems’ C-Wave, an extensive Layer-2.5 switched network deployed on the National LambdaRail (NLR), and several regional optical networks such as the Pacific Wave between the West Coast and Chicago, primarily for the academic community to conduct application experiments. CRCA- and Calit2-affiliated visual arts professor Lev Manovich authored the introductory text in the FILE catalog this year. In it, he argues that a well-known 20th century computer-graphics technique for representing smooth surfaces -- Non Uniform Rational Basis Spline, or NURBS – is evolving into a new tool for cultural theorists in the 21st century, along with other computer graphics and visualization tools.